CPU cooling options are continually on the rise. Ranging from passive heatsinks, heatpipe coolers, water cooling, and Peltier cooling to name a few. 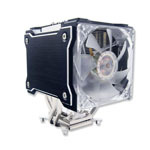 We are going to take a look at the ChillTec Thermal Electric CPU Cooler from Ultra Products. The Ultra ChillTec is designed to balance the use of thermo-electric and heat-pipe cooling to optimize your CPU cooling. How bout a contest so someone can win this beast? I am assuming they allowed you to keep it. I don't know if I can let go of it :twisted: . Will have to see what I can do. As bilko says... LOL I got you all fooled :twisted: , Im not that nice he he. i wouldnt mind that beast! First Post here... Problems with Ultra ChillTec please help.